It's officially December and Holiday shopping is in full swing. You've got tons of different people to buy for and don't know where to begin. Well I'm here to help with easy one stop shopping from Jane. Jane is a daily deals site with deals that run for 72 hours and daily new arrivals up to 65% off retail prices. They have a wide variety of items for everyone on your list from the tech obsessed to the coffee lover and everyone in between. Here I've rounded up my top 12 picks from Jane. 1- Bluetooth Beanie: This cozy beanie comes with a hands free blue tooth speaker inside. It comes in 5 different colors and is only $12.99. The perfect gift for the tech lover on the go! 2- Silicone Apple Watch Bands: This gift is perfect for everyone! These watch bands are interchangeable with any iphone and adds the perfect amount of style to any smart watch. 3-Makeup Brush Cleaner: This is the perfect stocking stuffer and a must have for any beauty babe. This is hands down the best way to clean your makeup brushes and they're only $3. 4-Tortoise Sunglasses: You can never go wrong with a classic pair of tortoise sunglasses. 5- Toddler Leopard Print Beanie: My girls love wearing cozy beanies in the winter and this one is just the cutest! It comes in several different colors (pink is definitely my fav) and the leopard is so on trend right now. 6- Coffee Tumblers: I'm sure you've got a coffee lover on your list and these insulated tumblers are a must! They keep your coffee hot for hours and come in 8 fun colors. 7- Amelia Sherpa Pullover: In the winter I'm all about the cozy sweaters and these sherpa ones are so soft! It makes the perfect gift for a good friend or family member. And of course I'm gonna pick one up for myself too! 8- Card & Cash Wallet iPhone Case: A wallet and phone case in one- so convenient! This is perfect for my husband and basically any guy on your list. It comes in 6 classic colors and is a steal at only $9! 9- Magformers 30 Piece Set: The perfect gift to really get your kids imagination going. This set comes with 30 geometric shape magnet tiles that they can use to build towers or any unique creation. It keeps kids entertained for hours and the magnets stack together for easy storage. 10- Personalized Name Necklace: Everyone loves a gift that is personalized and this name necklace is adorable. It makes the perfect gift for a new mom or even for your hard to gift mother in law. 11-Magnetic Utility Wristband: The perfect gift for the handyman in your life! My husband loves working on things around the house but is known for always losing things. This magnetic wristband holds the screws, nails and bolts so you don't have to- giving you the extra hand you always wanted. I got this for my husband last year and he never works without it. 12- RoboCombat Laser Tag Battle 2.5CH RC Helicopter: You can play laser tag in the air with this cool RC Helicopter! My son loves remote control cars and this helicopter is something new and fun that I'm sure he will love. There you have it. A perfect gift for everyone on your list with easy one stop shopping! There's toys for the kids, personalized jewelry for your mother in law, an insulated mug for grandma, tools for your handyman husband and even a cozy sweater for yourself. Of course the sweater I'm wearing here wrapping gifts is from Jane! 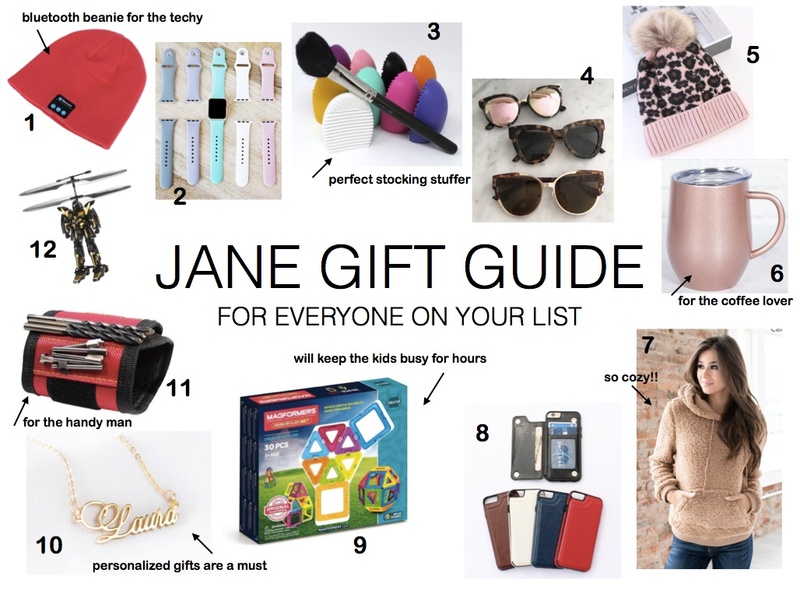 You can even get the Jane app and do all the shopping from your phone while on the go. How convenient is that! And the best part is everything is at a great price so you don't have to drop a ton of money on gifts. Just don't wait too long because the good deals always go quick! Thank you Jane for sponsoring this post!